Former Murrindindi Shire Mayor Lyn Gunter with SRT members Greg Moran (AU), Scott Jarman (AU) and Lynn Jarman (AU) in Dunalley, Tasmania’s worst hit town by recent fires, January 2013. ‘On entering the area, we witnessed the indiscriminate path of the fire noting that some areas of bush land and pastoral fields have been left untouched,’ said Scott. ‘But houses centered in the fields have been destroyed by embers reported as travelling some 15 kilometres and igniting on impact. Local residents were very pleased to see ShelterBox’s immediate response after the reopening of the access roads into the fire-damaged area, one being former Murrindindi Shire Mayor Lyn Gunter. 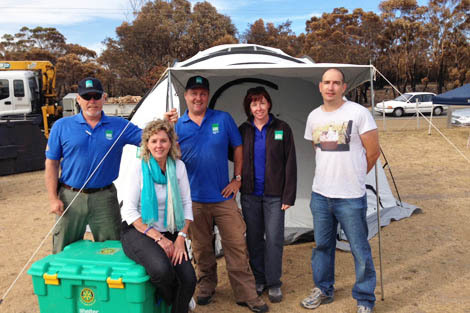 ShelterBox worked closely with her during the 2009 Victoria state Black Saturday bushfires that destroyed 1,300 homes. ‘The ShelterBox tents provided essential support for those in need during the crisis and they will once again be well-received by those that have lost everything to these recent blazes and need support to restart,’ commented Lyn Gunter.